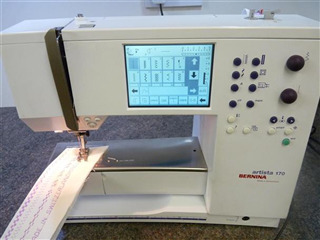 The BERNINA Artista 170 is a sewing machine with Embroidery unit. It has been fully serviced by myself and is in excellent condition. In fact the machine hasn't been used much and works extremely well. The Artista 170 has many included stitches which include letters, decorative, quilt, embroidery stitches, buttonholes as well as the basic stitches you would expect from a machine of this type. It's programmed to create 9 different buttonholes, which can be completed manually or automatically depending which you prefer. Several different feet are included with this item such as basic foot, buttonhole foot (and with slide), zipper foot and patchwork foot. The machine also comes with a sewing table, knee lifters and instruction binder. Please ask for more details. You can even expand the machine by purchasing extra embroidery cards for the embroidery module and also buy exclusive embroidery software. Free Delivery Within 20 Miles of SG7 6HL.